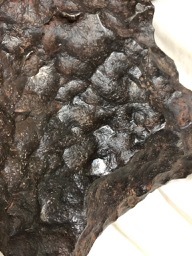 I am hoping some of you might help offer some advice on what I believe to be a meteorite. My elderly and not well brother-in-law bought this at the Tuscon Meteorite, Mineral and Gem show from a seller from Latin America back in 2000. He says he has paperwork somewhere, but I am not holding out a lot of hope he can find it. The seller told him that the "meteorite" came Patagonia. It weighs 74 pounds and measures 16"x12" and varies from 3-1/2" to 4-1/2". 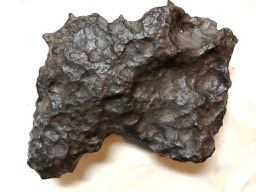 From the photos I have looked at online, I think it most resemble an iron meteorite. I have attached some photos. One blowup shows a 1/8" diameter hole and a second shows a dime-size area that is shiny silver almost like it was polished. So, my questions is what is my next step? I have read online that a small 1-2 gram slice should be sent to a lab for analysis and authentication. I hesitate to do that and not do it correctly and possibly compromise the value. Thanks in advance! I would guess the Campo Del Cielo meteorite. It definitely looks like an iron meteorite with nice regmaglypts. Agreed, it certainly looks like a meteorite. In light of its large size, how much did he pay for it? 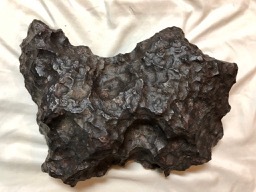 Definitely an iron meteorite, the weight correlates with the size, and the appearance is correct. Campo del Cielo would be a pretty good guess as Ron wrote above. These are recovered in Argentina, but Patagonia is also a source of iron meteorites. Cutting a small slice off would not significantly affect the value, but it is no trivial task. Specimens of this size are typically cut with a horizontal bandsaw. The most straightforward and non-destructive test would be to use an XRF scanner, this would show the relative amounts of iron, nickel, and trace elements. I would try a search of your location for a lab or university that would do the test for you. It may not be able to reach a definitive conclusion as to which fall it came from, but it will certainly be able to confirm it's the genuine article. Your meteorite is vaguely familiar. A nice meteorite with a natural hole tends to stick in peoples minds. If you post your photo to one of the more popular social media pages in a week or so (after the current Tucson shows) I think someone will tell be able to tell you the name of the original seller. Thank you all for the comments and suggestions, I am really starting at square one and have little idea of how to approach all of this. The eventual intent is to sell the meteorite and I appreciate the need to have it properly authenticated. Peter, your comment about it looking "vaguely familiar" makes me wonder if it was not already officially authenticated and properly named. I guess some more searching for the purchase paperwork might be critical and possibly answer a lot of questions. Thanks again! Edited by steelguy49, 12 February 2019 - 08:04 PM. Just an update on my latest efforts to learn more about the sample. My brother-in-law has not been able to find any paperwork he believes he received with the purchase 19 years ago, so dead end there. In the meantime, I did contact The Museum of Natural History in New York City and they suggested that I contact a professor at Rutgers University in New Jersey. 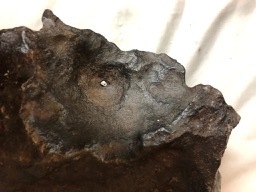 Rutgers is a 1 hour drive, so I plan to take the specimen down their within the next 3 weeks for their analysis and hopefully authenticate it as a meteorite. Does anyone know from similar experience if a university typically charges for that service? If so, how much might I expect to have to pay? The journey continues!